Just got my third Japanese brochure, this one from the 2007 production in Osaka. Interesting how the covers to all my Japanese souvenir brochures are completely different. I know the Japanese productions are quite 'squeezed' in look but it seems especially so with this one. Some nice pics though, especially one of 'Il Muto' which seems to be shot at a distance so it includes the proscenium and chandelier. Christine's gown thing she wears on the rooftop looks very very blue compared to the current one in London, which is more of an aquamarine colour. The Phantom's mask is odd, particularly when you look at it in profile -- the outer edge has the curve of a circle rather than fitting the contours of the face. Hi, i'm new to the boards, i used to post on phansonline and phans.net a few years ago. I've only just found this place. I'm hoping someone can help me in regards to the London brochures. I have a few brochures from other productions but my main collection is the London ones and i'm trying to get all of them, i'm not that far off either. I have a checklist of all the London ones (there may be a few gaps but i think it's complete) up until the Nov 05 one with Earl Carpenter, which sadly was the last time i saw the show. So i was hoping someone could help me compile a list of the brochures after the Nov 05 one, i know a couple of them but need to fill the gaps. Thanks! Woo hoo! I've just won another brochure on ebay to add to my London collection. May '90 Peter Karrie. Weirdly there were two brochures printed May '90 one with Willetts and one with Karrie. Got my May '90 Peter Karrie today. Its kinda cool because its the first ever brochure of Karrie. Hey does anyone know if there was a brochure printed of Mark Mckerracker from London or if they did a brochure insert featuring him, i've never seen of one and he did only play the role for about 2 months in London so there probably isn't. But if anyone knows anything please let me know. London-Phan wrote: Got my May '90 Peter Karrie today. Its kinda cool because its the first ever brochure of Karrie. Hey does anyone know if there was a brochure printed of Mark Mckerracker from London or if they did a brochure insert featuring him, i've never seen of one and he did only play the role for about 2 months in London so there probably isn't. But if anyone knows anything please let me know. That's a good point, that it's the first ever with Peter Karrie. He became quite a Phantom legend. It does, however, show up in the UK tour list. Thanks for posting that, i have been on there. Thats the list that i used to help me compile my complete list of London brochures. I used the ones on there aswell as the ones i have that weren't on there and ones that i know other people have that aren't on that list. I don't know if they would have printed one with Mckerracher as he was only there from middle of july until begining of september so less than two months, but then on the other hand its quite possible they did. Maybe i could try contacting dewynters and see if they can help? Oddly enough, I was in London shortly after McKerracher's run, and although there was no brochure, there does seem to be some pics that are slightly different from the UK tour ones (or atleast not used in the tour brochures) there was one of those "this is what is playing in London theatres" magazines out and it had in this pic of Mark that is not in any of the UK tour brochures. A similar one, with Peter COusens, Shona Lindsay and Mike Sterling, from 1998. I would have bought this, had it not been for the fact that it's seriously overpriced. I mean $23 as starting price? But if you want a better run for your money, why not pick up an earlier brochure with Dave Willetts, Claire Moore and Michael Ball? This one is from November 1987, and current price is around $10. I own the Raoul Tour (2 US NT) Brochure from August/September 1992. It features Kevin Gray, Teri Bibb, and Nat Chandler, although LuAnn Aronson is listed as Christine in the biographical insert (she must have just joined). I also have the program that goes with it (Boston, MA-The Wang Theatre). Sarah Pfisterer was the alternate Christine. That's the only archival one I really own. I have brochures for only some of the casts I have seen... Keegan/Pitcher(Voytko)/Cudia. I saw Cudia and Voytko opposite each other... quite the chemistry! I also have the Vegas one as a gift. Unfortunately I haven't been in the consistent habit of buying them. But I think that is because I am not interested in purchasing the same program over and over for 7 pictures on an insert. It's really too bad we don't have them updated every time there is a cast change. You know that's only the US brochures, right? I think you do, just wanted to point out that all other productions is/has been updating their brochures on a regular basis (as in changing most or all pictures for each new cast). In case someone else didn't know. Oh, yes, I am aware of that. Which is what makes the US brochures so disappointing! What I meant was, I never really buy them at the performances I go to, because it's really a waste of money. Apparently, if you ask nicely (and get a receptive seller), the US souvenir brochure person might slip you a cast insert for free. I've seen that happen on tour, at least. 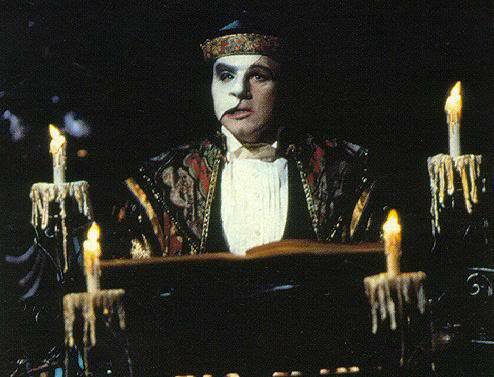 Large London brochure with Scott Davies as the Phantom (ca. 2000, in other words). But $30 seems a bit overpriced. The Stuttgart brochure and cast programme, currently three euros, but ships to Germany only. Speaking of which, I just bought a Hamburg programme... It was from 1992 and slightly overpriced, but I lack that one in my collection and have wanted a new German one for ages. Now, if I could just find that Austrian "Complete POTO" book! ETA: Got the latest Japanese brochure yesterday, courtesy of Jennie J. (last person we interviewed in the POTO mockumentary). She recently saw the Nagoya production, and picked up a brochure both for me and Josefine. Which I highly appreciate! The cover is beautiful - black, with a golden frame, and with a golden logo placed somewhat to the left. But the actual pictures... From the look of it, I think the Japanese production(s) has gone somewhat downhill. The focus is very much on Christine and not so much on the Phantom. The pictures seems uninspired, and they're also so dark! I used to love the Japanese brochures, but this one might be the least interesting of those I owned. Still, I love being able to add it to my collection, for references and for completeness. Raphael wrote: Apparently, if you ask nicely (and get a receptive seller), the US souvenir brochure person might slip you a cast insert for free. I've seen that happen on tour, at least. Definitely saw this in Toronto. Ushers and sellers at the Princess of Wales theatre are almost always genuinely nice people--and don't mind slipping a show insert now and again... but sshhhh! you didn't hear it from me. Dutch "programma" for sale, I think this is only the cast list/credits part of the souvenir brochure. The brochure had an own pocket for the cast programme. But very rare to see on eBay! operafantomet wrote: Speaking of which, I just bought a Hamburg programme... It was from 1992 and slightly overpriced, but I lack that one in my collection and have wanted a new German one for ages. Now, if I could just find that Austrian "Complete POTO" book! I was also surprised at the pictures I have to say. They aren't in the same league as my other programmes for sure. And many of them are so small and dark. But it was fun to get it anyway, of course . Phantomlove wrote: I was also surprised at the pictures I have to say. They aren't in the same league as my other programmes for sure. And many of them are so small and dark. But it was fun to get it anyway, of course . Glad I'm not the only one thinking that... I was a bit surprised to see the content, especially after seeing the nice cover. But yes, wonderful to actually have it, both for references and for the content. Now, it has the original cover with a large mask and "Das Phantom der Oper" in golden, posh typing (not the logo font). I have the ones from 1991 with original cast Peter Hoffman and Anna Maria Kaufmann, so it must be after that. But it must also be before the new cover and new pictures from 1993. So I'm thinking I got a 1992 program after all? But it would be nice to get it confirmed. Just got the original LA Cast brochure today with the cast insert! My Aunt bought it off Ebay for me and paid $50 for it! To be honest, that sounds a tad overpriced. Unless it was signed? But anyhow an important brochure to own if you're a collector and/or thinks Crawford was fantastic in the role. So congrats! lol ya, $50 is a lot. The starting bid was 99 cents, then these two people started having a bidding war over it. Then my Aunt got on and trumped both of them. lol It was supposed to be a Christmas present but she decided to give it to me early. Woohoo! And yes, it is a goal of mine to own every program Michael was featured in. Callie Daae wrote: lol ya, $50 is a lot. The starting bid was 99 cents, then these two people started having a bidding war over it. Then my Aunt got on and trumped both of them. lol It was supposed to be a Christmas present but she decided to give it to me early. Woohoo! I'll never forget when I sniped a Brochure of the LA cast - signed by all three leads, and a few others (I have to confirm in the book). The ending price? 7 dollars. Nobody wanted it! Even the seller was shocked. He wrote to me saying he thought the brochure would go higher, but he was happy that it was going to someone who was a fan of the original cast. He had no information on when exactly it was signed. Callie Daae wrote: And yes, it is a goal of mine to own every program Michael was featured in. Hmmm... I have a London program with him, Sarah, and Steve. I of course have the original LA Cast. Callie Daae wrote: Hmmm... I have a London program with him, Sarah, and Steve. So what you lack is the 1987 London one with him and Claire Moore. And possibly another B'way brochure? Hmm. You have a nice collection so far! Yes, I really want the one with Claire!